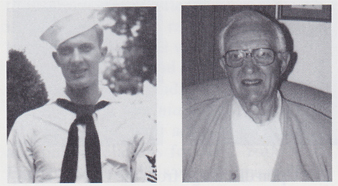 Owen Leroy Brown, Chief Machinist Mate, born Oct. 15, 1920, Denison, KS, spent his early life in Galva, IA, and enlisted in the USN after graduating from Galva High School. He joined the USN Sept. 10, 1940, and in December 1940, he was assigned to the USS West Virginia at Bremerton Navy Yard. Other stations were Great Lakes, IL, and the USS MacDoungh (DD-351). On Dec. 7,1941, they lost their ship at the Pearl Harbor attack. He spent some time on the USS MacDoungh (DD-351). In August 1942 he was reassigned to the West Virginia. After the war he was assigned to duty on the Sakawa, ex-Japanese C.L., which they sailed from Japan to the Island of Bikini where the first Atomic bomb was tested on all types of ships. The Sakawa sank and he was sent back to the States. MMC Brown was discharged Nov. 11, 1946, M Div. He received all the service awards in the South Pacific. He married Bessie Watson, Aug. 31, 1944, in Lakewood, CA. After 50 years of marriage, she passed away, Dec. 7, 1994. He has one step-daughter and two grandchildren. He worked mostly in the construction industry, building homes, office buildings and hotels as a purchasing agent in Washington State and retired in the Seattle area in 1982.